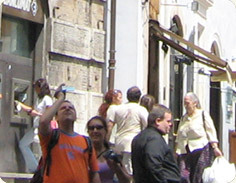 The entertainment and nightlife in Rome consists mainly of the streets and outdoor cafes and restaurangs. Here you can meet, socialize and eat and drink. Restaurants and bars are filled in the evening (tips on good restaurants and bars can be found in the menu on the left) but there are also other places to visit for a fun evening. For me, the nightlife in Rome is much about the lovely cafés and the street life. In the district of Trastevere and the area around Piazza Navona you find a lot of people, both young and old. You are never far from nice restaurants in Rome and along the Tiber thera are several bars, among others at Castell Sant 'Angelo. In many of the tents the play music and some of them also have live perfomrancens (rock bands, DJs and singer-song writers). Superclub is close to the Pantheon and has a well-filled champagne bar. Goa äis one of Rome's greatest disco with häög pulse, large dance floor and spectacular laser show. Acc. mission shall Leonardi di Capri partying at Goa when he visited Rome. La Maison is often visited by famous international Guests and have a private VIP area. Testaccio is a neighborhood with many small places that attract visitors later in the evening. You'll find everything from piano and rock bars to discos. Here you find Radio Londra and Romes largest gaydisko; Alibi. Gilda is a stylish place for a little more adult audience and you can find it next to the Spanish Steps.